Breast Cancer Awareness free check-ups at City Centre Qurum this week! The month of October is known around the world as Breast Cancer Awareness Month. Here in Oman, many fundraising events have been taking place and lots of companies have got involved to help raise awareness and money for the cause. 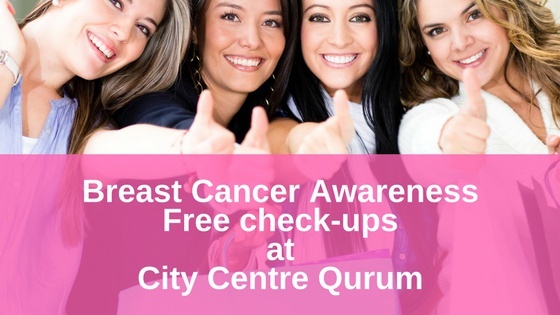 However, at City Centre Qurum this week (October 23-24) City Centre Qurum, they are offering free Breast Cancer Screening to any ladies 40 and above and a complimentary clinical breast examination for women of all ages who wish to get checked up. Also up until the end of October on Thursdays, Fridays and Saturdays, shoppers can buy tickets for the annual Walkathon event taking place on October 31, 4 PM at Qurum National Park they just have to visit the OCA counters located at City Centre Muscat and City Centre Qurum.